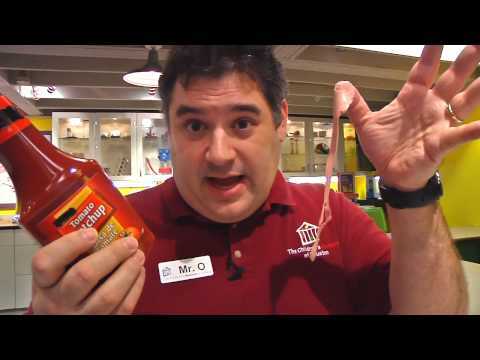 Way back on "A Slime By Any Other Name," our first O Wow Moments episode, I showed off a fun slime concoction called Oobleck that we regularly make here at the Children’s Museum of Houston. Tone Generator – there are a number of apps available for mobile technology as well as several free tone generators available for download online if you choose to use a computer. Amplifier – your basic stereo amplifier will do the trick. Audio cable – to connect the audio jack from your mobile device/computer to the stereo. Baking Pan – I’ve seen videos where they pour the oobleck directly into the speaker, which can ruin the speaker. I’ve also seen them with plastic wrap but, again, I wanted to protect my speaker with more than just a piece of plastic. Oobleck – see recipe above. Place the pan onto the speaker and hold it in place. You should start to see the tendrils forming. You may need to help get it started using a finger or a pencil. If it doesn’t work, try adjusting the tone and/or volume level. Remember that sound is vibrations. Those vibrations create pressure on the Oobleck causing it to stiffen. The stiffened Oobleck rises with the pressure allowing fluid Oobleck to flow underneath, whereby it stiffens and adds to the tendrils. If a tendril gets too high, it starts to reform a fluid and falls, rejoining the other Oobleck. Try adding some food coloring and watch what happens!